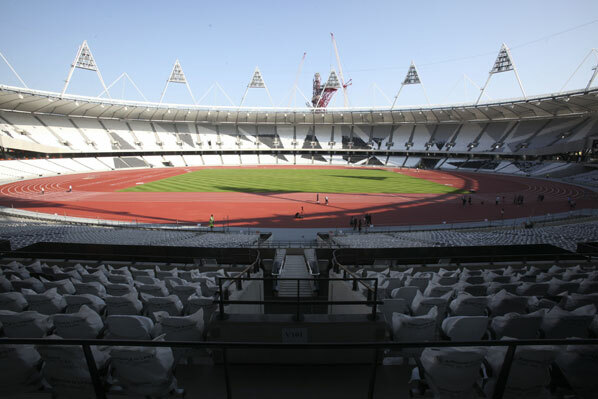 Top British athletes witnessed the unveiling of the track in the Olympic Stadium today as London 2012 celebrated another milestone on the Olympic Park. School children from West Ham Church Primary School in the Host Borough of Newham raced alongside some of Britain’s best athletes on the brand new track. World record holder and Paralympic gold medallist Dan Greaves, British long jump record holder Chris Tomlinson and IAAF World Championships silver medallist Hannah England were the first athletes to take to the track. London 2012 Organising Committee Chairman Seb Coe said: “Today marks a huge milestone for the project, as the Olympic Stadium starts to come to life and people get a glimpse of how it will look in less than ten months’ time when we welcome the world’s athletes to London. The track, made of a prefabricated material manufactured in Italy by Mondo, will provide a fast surface for athletes during London 2012. The same surface has also been used for the 80m warm-up sprint straight under one of the main stands, while a 400m training track near the Stadium will be laid shortly. John Armitt, Olympic Delivery Authority Chairman, said: “Watching athletes and children run around the Olympic Stadium’s track ten months before the London 2012 Games highlights just how much has been achieved over the last four years.